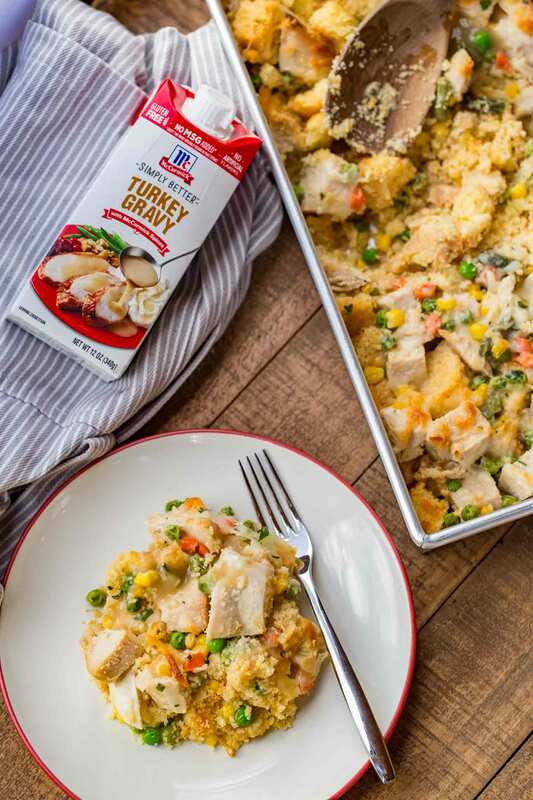 Leftover Turkey Casserole made with leftover turkey, cheesy gravy, and cornbread is the PERFECT way to use up Thanksgiving leftovers. It’s fast, easy, and ready in under 45 minutes! We’re REALLY excited for the Thanksgiving holiday that is quickly approaching, and if you take a look in our kitchen you’ll find a lot of things going on like Easy Roasted Turkey Thighs, Crispy Slow Cooker Turkey Breast, and this Slow Cooker Thanksgiving For 2! We always have a TON of leftovers after Thanksgiving, and Leftover Turkey Casserole is exactly how to use them up in the best way possible. It’s creamy and indulgent, totally filling, and reminds you that the holidays aren’t quite over until all of the food is gone. Most great casseroles start with something called a roux – a mixture of flour and butter. 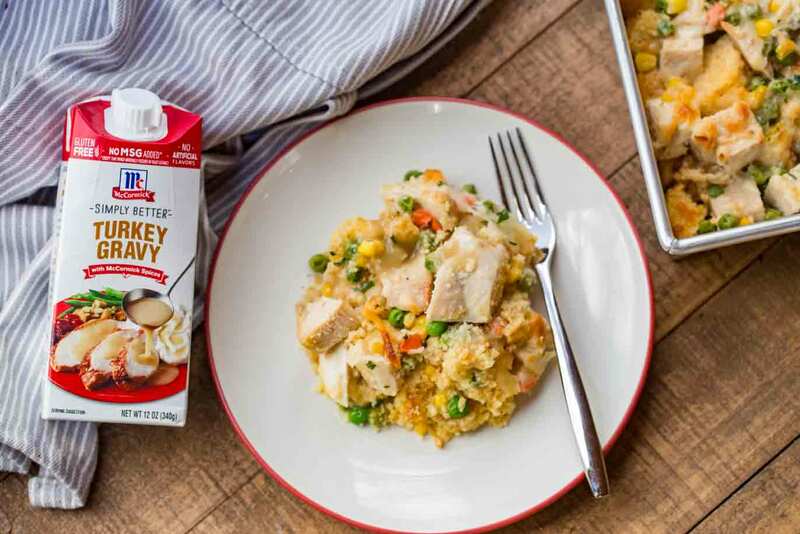 Here, serving the function of the roux, we’ve added McCormick Simply Better Turkey Gravy and mozzarella cheese to create a really creamy and flavorful base for our casserole. 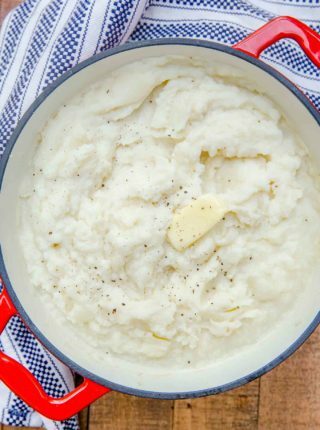 This gravy holds everything together and makes it something that your family will request every single year. Besides the turkey, gravy is the star of the show here, adding a TON of flavor and texture to the dish. McCormick Simply Better Turkey Gravy has no MSG, artificial flavors, or colors added, so I feel good serving it to my family. It’s also gluten free, so those of you who have stayed away from gravy because of the flour base can enjoy this gravy with no worries. You can even use it for the actual holiday, if you want a great gravy that you don’t have the think too much about! If you’re looking for a dry alternative too you can also use the powdered mix McCormick has which has no MSG, no artificial flavors or colors added. It’s as easy as adding water and bringing to a boil. When Thanksgiving is over I feel like we have piles of all the leftovers except gravy. Now you can remedy that and keep Thanksgiving going full steam ahead clear through the weekend! Casseroles are really easy to meal prep. Just assemble your ingredients up until the baking part. Cover the casserole tightly with plastic wrap and refrigerate for up to 1 day, until you’re ready to bake. 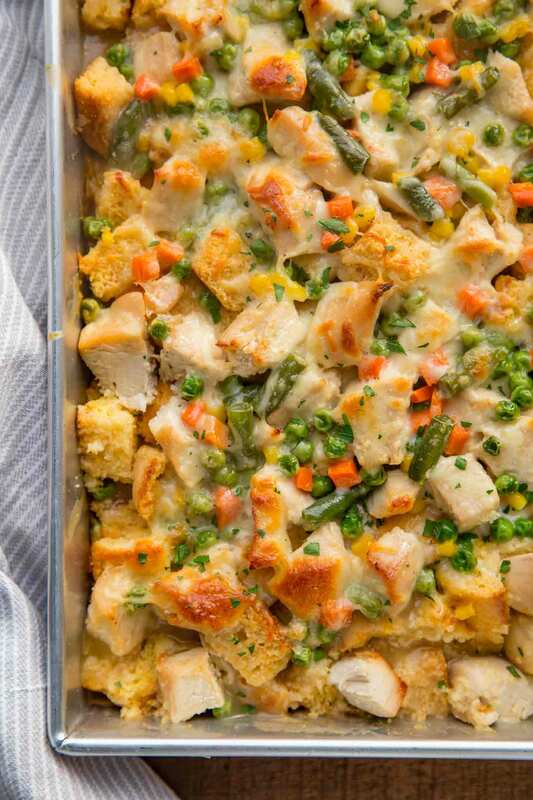 You can also assemble and freeze this casserole. Take it out of the freezer the day before to defrost and refrigerate, then bake as directed when you’re ready. 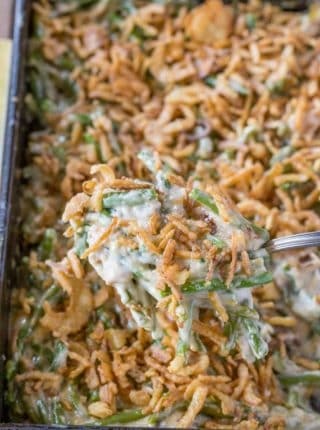 CAN YOU MAKE LEFTOVER TURKEY CASSEROLE WITH NOODLES? If you don’t have cornbread, it’s really easy to make leftover turkey casserole with noodles. Cook your pasta to al dente. Make the recipe as is, and instead of adding the cornbread, add the noodles and stir to combine before you bake the casserole. You can also certainly use dried bread as you would for a classic Easy Apple Sausage Stuffing. You can also do this casserole with cooked rice. I used cornbread in this recipe because it’s what I have leftover from Thanksgiving. But it’s not mandatory, as long as you have a starch in there. Use cooked rice, because uncooked will soak up most of the moisture when you bake it. WHAT ELSE CAN I DO WITH THANKSGIVING LEFTOVERS? HOW LONG IS LEFTOVER TURKEY GOOD FOR? Leftover turkey will keep for 3-4 days in the refrigerator, or 2-3 months in the freezer. If we have a lot of leftovers, I like to freeze the turkey and use it for recipes later in the month. 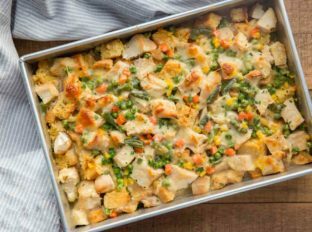 WHAT CAN I SERVE WITH LEFTOVER TURKEY CASSEROLE? 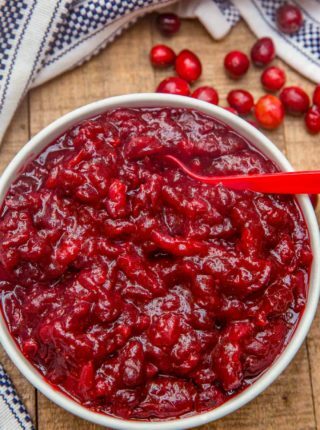 Serve leftover turkey casserole with Easy Cranberry Sauce for the full Thanksgiving leftovers experience. Add a Classic Wedge Salad, which is great way to start a meal with a heavier dish like leftover turkey casserole. Plus it’s an added veggie! The point of a Thanksgiving leftover casserole is obviously to use up the leftovers from Thanksgiving, so don’t feel limited to this exact recipe. If you have Brussel sprouts, cut them up and use them instead of green beans. If you don’t have cornbread, use stuffing. You get the idea. 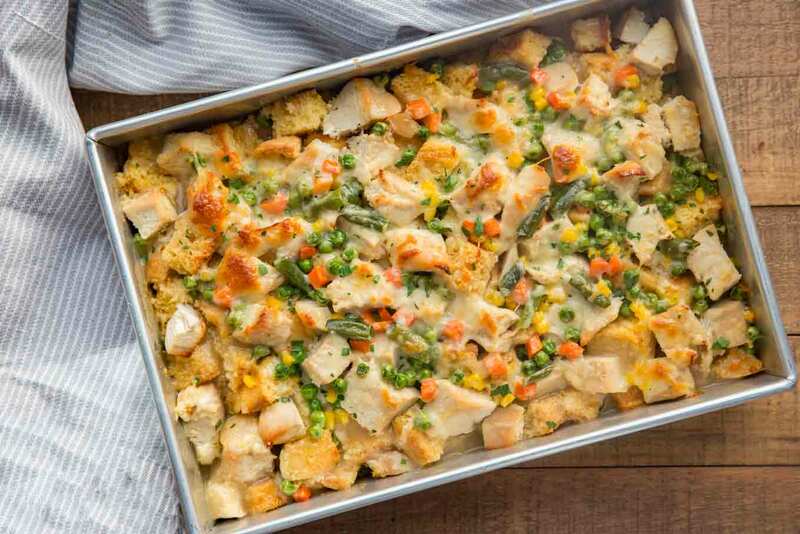 If you want to make this casserole another time of the year, you can easily swap out the leftover turkey for chicken in this recipe. I’ve even made this with leftovers from my slow cooker rotisserie chicken before! Uncovering the dish for the last 10 minutes of bake time is important to achieve a nice golden brown on top. You can also turn on the broiler for 2-3 minutes, but watch it closely and don’t go too long. Preheat your oven before adding the casserole, or you may have to add some cook time. Leftover Turkey Casserole made with leftover turkey, cheesy gravy, and cornbread is the PERFECT way to use up Thanksgiving leftovers. It's fast, easy, and ready in under 45 minutes! This casserole turned out very well. I used leftover turkey gravy from Thankgiving. I didn’t have mozarrella so I used gruyere. I used lactose free milk with a little lactose free evaporated milk added to make a cup. I didn’t have these frozen veggies, so I used a blend of Asian frozen veggies. Even with all these changes, the dish was very satisfying. Sounds delicious! I love that this dish is totally customizable to what you have on hand. YES! I always need ideas for leftover turkey. Totally making this! Holiday leftovers are the best! We LOVE leftovers!! I can’t wait to try this! It looks incredibly delicious!! 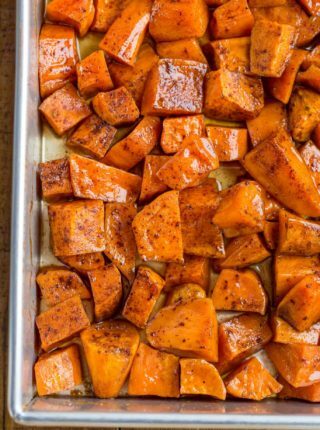 Such a great way to use up Thanksgiving leftovers! Love the addition of the cornbread! Thanks, Jamielyn! The flavor is amazing and has everyone looking forward to leftovers! !